Small stream and eluvial gravel deposits of tin and gold, mined from 1888 until 1914. Xenotime and Fe-bearing gahnite were found in sands and gravels along the courses of Pegasus and Smith's creeks in the Port Pegasus area (Hutton 1957). 'The stern reality that all is not gold that glitters' H.A. Gordon (1890) after visiting the area. This is the location of New Zealand's only cassiterite rush in 1888, however by 1890 it was all over, the alluvial miners not finding the amount promised by the wild speculation that followed the discovery. It had been promoted as New Zealand's Broken Hill (Australia), or another Mount Bischoff (Tasmania). It was comparable to neither. A total under one tonne of cassiterite has been extracted from the field for its entire history. The crest of the range is a biotite schist and quartzite folded roof pendant in granite. The area consists mainly of massive coarse grained biotite leucogranite, cut be simple alkali feldspar-quartz-mica pegmatoid veins, and some aplites, and finer grained granite dykes. On the north-east shores of the North Arm is gneissic microcline rich muscovite granite, and on the north-east flanks of the Tin Range garnetiferous granite, containing 5-10% volume pink garnet clusters. The cassiterite, wolframite, gold, and garnets found in the streams have been eroded from the granite over the eons. Some veins have been found, although no mother-lode was ever discovered. The cassiterite has come from greyish quartzose greisen, containing quartz, biotite, topaz, and gahnite, cutting veins containing quartz, biotite, topaz, and manganiferous garnet. The cassiterite rich quartz veins are around 300 mms thick at the southern end of the range, decreasing to 180 mms thick further north. The lode zone traverses dark brown schist as a series of anastromising veins up to 6 inches wide. The veins are quartz in which topaz and garnet is scattered irregularly. Wolframite occurs as aggregate masses easily seen in hand specimens. Cassiterite is less abundant, occupying cavities in the surface of the wolframite clusters. None of the veins are economically important. 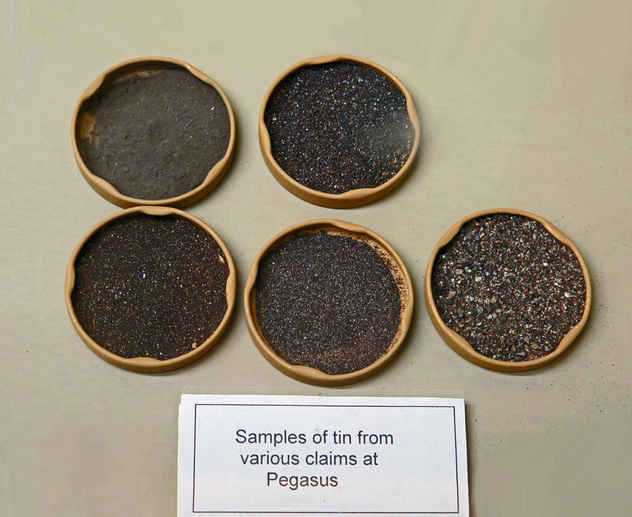 Louis Longuet and Harry Allen discovered gold in Pegasus Creek in 1882, but were annoyed by a heavy black sand which got in the way of the gold extraction. They abandoned the area as not worth their while, however the news attracted a party in part consisting of George Swain, A.E. Livingstone, and James Thomson in 1888, who sent samples of the sand to Professor James Gow Black of the Otago University. 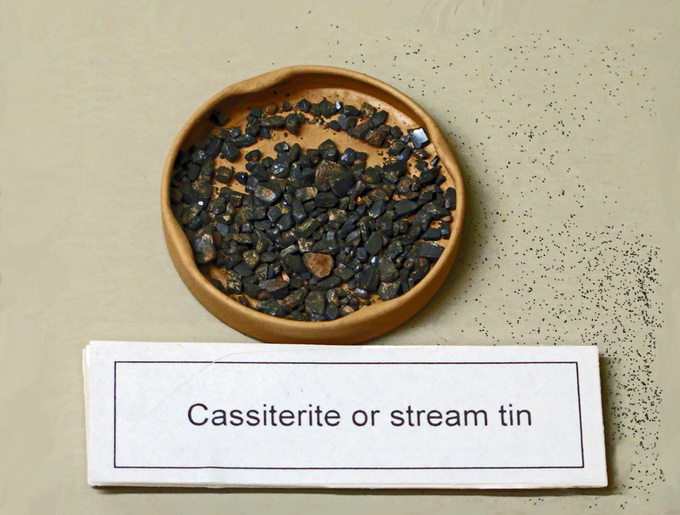 Testing proved it to be cassiterite. Black immediately left for the location. He was well known in New Zealand at the time, holding public lectures demonstrating chemistry. Black was a born showman, his enthusiasm kept in check but only just, by his trusty and calm assistant 'Wully' William Goodlet. He charted a boat in Invercargill, with Charles Robertson captaining, but his activity drew attention, and as they left Bluff, were followed by other boats. Soon several hundred miners were on the field. By June 1889, seventy-one mining licences had been applied for. T.S. Miller, H. Dundas, J. Hay took nine months to survey the field, a task deserving of an award considering the impenetrable scrub, remote location, cold wet weather, and steep terrain. Most of the claims were speculative, with only a few miners trying their luck in ground sluicing. Black is now found just below the highest point in the area, called Trig D (503 metres), tunnelling onto a lode, however it proved unsuccessful. William Smith was his mining partner. The partially flooded 280 foot long adit, with mullock heap at its mouth remains. William Goodlet was with Black during this time. Louis Rodgers opened a post office, store, and shortly after the Pioneer Hotel. He was bankrupt mid 1890, when the field turned out a fizzer. The hotel was purchased by Robert Fraser, and Arthur Ford, and remained open due to a fish freezing works constructed on the other side of the bay. The hotel closed in 1914, and was dismantled in the 1940's. The price of cassiterite and wolframite rose sharply in the early 20th Century, as countries armed themselves for the pending World War One. The Stewart Island Tin and Wolfram Lodes Limited was formed in 1912, in Dunedin, promising a fortune to be made to any investors. A large wharf, cottage, three huts, tramway, store, blacksmiths, dam and fluming all were completed by December 1915, costing 9000 pounds. 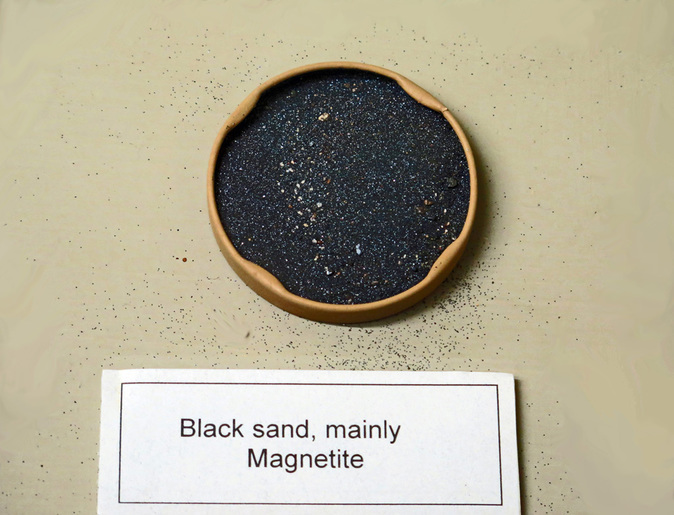 Six months of mining later, the company had extracted 12 pounds worth of cassiterite. The operation was abandoned, leaving everything behind. In the 1920's and 30's, a Dane called Carl Yunge (Big Charlie) lived at the former fishing base, prospecting for cassiterite part-time. Ex-civil engineer from Napier, Ted Carrington spent summers from 1937 mining cassiterite on a small scale, with help from a young Peter McKellar. Small amounts of ore were carted off the island for Carrington by Bill Thomson, and his boat Ranut. Mining ceased in the early 1940's. Carrington accompanied G.J. Williams, and a party of Otago University students to the site in 1949. The miners of 1888 had coped with the thick scrub with a scorched earth policy, namely it was all set on fire. While initially destructive, the regenerating scrub proved a perfect habitat for the Kakapo, a very rare flightless parrot, its presence discovered in the area in 1977. All individuals have since been removed to predator free islands. The remote location has largely resulted in any equipment left behind remaining, although it is often difficult to find in the dense scrub. The buildings along the shoreline are gone, but inland are several areas showing ground and hydraulic sluicing, hut sites, dams, tail and water races, piping, valves, stacked tailings, sundry mining equipment, and a tramway. Generally speaking the main areas of activity were near the confluence of Pegasus Creek and McArthurs Creek; the headwaters of McArthurs Creek west of Trig D; and an area east of Trig D at Smiths, Scollays and Ellis creeks. Cassiterite claims were also at Kopeka Creek to the north-east. Robert Scollay, H. Simpson, William Todd, G. Swain, A.E. Livingstone, J. Hunter, J. Edwards, T. Gilroy, E.A. Hagan, G. Wills, W.S. Moir, and Alex Glennie are all noted by (Petchey, 2006) as having active claims 1888-1890, where tin workings could be seen. Port Pegasus is remote, the only viable access is by boat. The area is covered with thick scrub, obscuring many of the locations. The weather is often bleak, with no mobile coverage, and steep terrain. The nearest human habitation is Oban. A large boat is needed for the open rough waters from Oban to the location. A local charter company will set you back around $1900 (NZ) at the time of writing, to get you to the shoreline. It is illegal to remove any items, or dig anywhere. The Robertson River area on the eastern side of Tin Range is a restricted area, needing a permit to enter by the Department of Conservation. Mindat co-ordinates are approximately where Black's adit is located, which also conveniently is the middle of the mining field. Description: Deformed quartzite; pelitic; psammitic; calc-psammitic and amphibolitic schist with pegmatite dikes. Description: Amphibolite facies pelitic and psammitic schist, quartzite, calc-silicate and amphibolite with pegmatite dikes. Hutton, C.O. (1957) Contributions to the mineralogy of New Zealand. Part IV. Transactions of the Royal Society of New Zealand 84, 791-803. Reed, J.J. (1958) Granites and Mineralization in New Zealand, New Zealand Journal of Geology and Geophysics, 1:1, 47-64.
Henley, R.W., Higgins, N.C. (1977) Geology of the granitic terrane south-west Stewart Island (Note). New Zealand Journal of Geology and Geophysics, 20:4, 779-796. Walrond, C. (1999) On the Metal-The tin miners of Port Pegasus. New Zealand Geographic, issue 042, April-June 1999. Petchey, P.G. (2006) Pegasus Tin. Archaeological survey of the Pegasus tin field, southern Stewart Island/Rakiura. Science and Technical Publishing, Department of Conservation, Wellington.